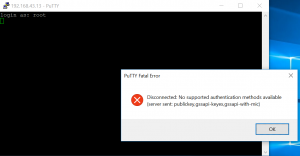 Receiving error When trying to access Linux server through putty or other tool using ssh service. Edit /etc/ssh/sshd_config configuration file using vi editor. Than restart the ssh service using below command. Now try to access the server and sure it will work. Still if you are facing error in accessing the server, that there might be issue with firewall configuration.